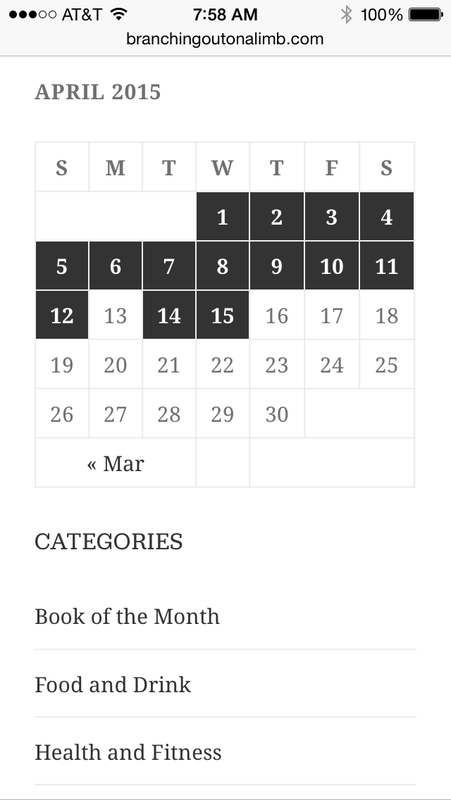 On Monday, I had intended to give an update on the Book of the Month. Even though the plan derailed, my train of thought is powered by a compulsive desire to see those little calendar dates all filled in, each and every day. Look at that empty spot… just taunting me. Monday was Migraine day. Sometimes after a migraine ceases you feel physically lighter, floating or at least as if a weight has literally been lifted off of your head. Sometimes you feel as though pressure has been released… or that the vacuum chamber that you are stuck in has finally unlocked and your entire being is returning to normal. Weird, I know. It feels cathartic to just explain what the pain feels like to me. I wonder if by being able to put words to the extreme discomfort that I am conquering it in a way? Psychologists, doctors, med students, and Psychiatrists, feel free to chime in. Seriously. So, Monday I didn’t even lift my book. I didn’t even lift my body off of the couch most of the day. Need a good laugh? Go get this book. Bill Bryson’s “The Lost Continent.” Warning: you have to have thick skin to read this book, because he busts on just about everyone across the country. Overall I am loving this book, lots of laugh-out-loud moments! And, later today I will move this post on over to Monday. Where it belongs. Out, damned blank spot! Out, I say! …I wonder if Lady Macbeth had migraines? The month is halfway over. I am more than halfway through my book, but failing at this running challenge. I won’t give up, though. I have friends who have gone back to college and set far higher fitness goals than I have- out of respect for them, and myself, I’ll keep plugging away. They truly inspire me! Need a reason to challenge yourself with new projects, plays, and books, recipes, etc.? Go online, look up “neural plasticity” and follow links on reputable websites. (here’s some!) Even better, enter “neural plasticity” into the search bar on Pinterest… now sit back, and start reading. In a nutshell: when you experience new things your brain is energized. Doing something new every day and going out on a limb is my way to help get over years of anxiety. If I also end up expanding my cognitive abilities, broaden my perspectives and become more creative, even better! “Creativity is just connecting things. It seemed obvious to them after a while. or they have thought more about their experiences than other people. Unfortunately, that’s too rare a commodity. A lot of people in our industry haven’t had very diverse experiences. without a broad perspective on the problem. I’ve been so focused on daily business that I rarely have done or tried anything new or challenged myself in what felt like YEARS. Bottom line is, running a blog about trying something new daily has become my way to get over the freezing effects of anxiety, to force myself to make decisions and not be afraid to try new things. Trying to coordinate with extended family to attend a theatrical performance is even harder than trying to coordinate an appointment with my son’s ortho and dentist. it is not easy to make Indian food, actually ANY food look good in a photo. Maybe February’s project will help? Family is totally fun to mess with by dragging them into this project! How to link up within a post the web pages to my photos or to those that should be connected to an original site- like the Comic Pearls embedded in my post here. inserting links wasn’t that hard, either, like this! The tech support chat really does work! I love that I picked a layout for my blog titled “2015,” reminding me of the blog’s overall goal. January’s Book of the Month, The Happiness Project,” by Gretchen Rubin… I get a kick out of statistics and studies, I’m weird like that, so I’ve enjoyed reading her summary of literature and philosophies, as well as the 12 months of tasks that she chose to explore. …and many, many more favorite passages could be listed, because I enjoyed this book tremendously. I definitely recommend “The Happiness Project” to anyone. In one month I’ve banked two really enjoyable experiences- a new read and and a new skill. Here’s to the anticipating eleven more of each to come!